Are you dreaming about your wedding in Rome? Believe me, being a wedding photographer in Rome Italy is always a great satisfaction. Tania and Karim, from Switzerland to Rome in the splendid setting of the Janiculum to promise eternal love. We met with Tania several years ago on the occasion of another photo shoot, and immediately I thought that she was a really interesting person: theater, dance, a thousand interests and an enthralling smile. What a great occasion to have a great wedding in Rome, with those nice guys? Months later, when she called me to give me the privilege of telling his marriage, I was sure it would be an unforgettable experience. And then for them, two thrilling people, like their very nice guests. So, are you already thinking about a great, unforgettable wedding in Rome? First of all, for the places, so beautiful. 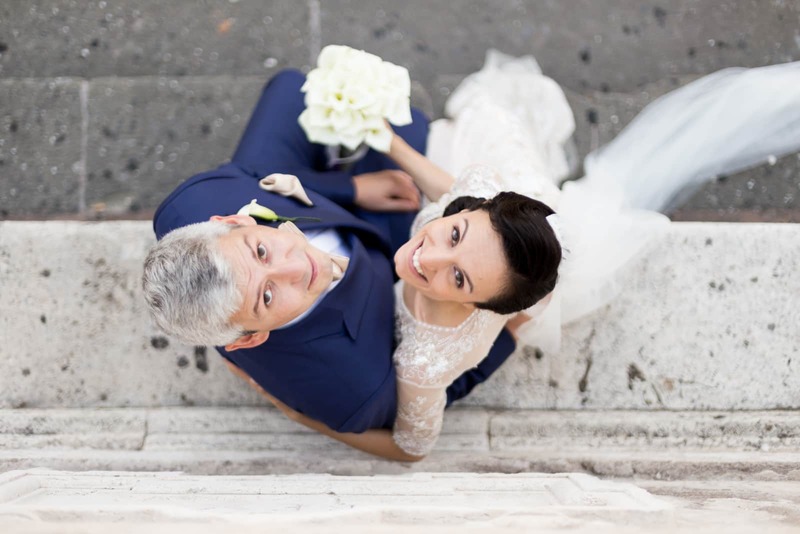 Taking wedding photo at the Donna Camilla Savelli hotel, a really elegant location, and then the church, the Janiculum. If you hear talk of the “8th Hill” of Rome, don’t be surprised: Janiculum is one of the highest hills, even though it isn’t one of the Seven Hills of the “Eternal City”. But it is famous for being one of the most charming corners of Rome — a balcony with breath-taking views over the expanse of churches, piazzas, and monuments below, with the meandering Tiber taking centre stage. Towards the east, the hill descends to another famous and ancient Roman quarter: Trastevere. The name Janiculum comes from the belief that in ancient times it was the place where the god Janus was worshipped. A memorable day for me, as a wedding photographer, and for them certainly, a day that has flown away, so fast. with an unforgettable sunset over the landscape of Rome. In addition, check out other works in Rome, also about a lovely engagement in Rome, in the middle of he millennial history of the eternal town.